Artwork by Lisa Colom. Click each photo to view larger. Commissions are currently open for needle felted sculptures such as pet commissions, wild animals, dolls, ornaments and more. In the past I’ve also created pieces using a combination of wet and needle felting such as purses, drink cozies, wallets, bird homes and other useful items. 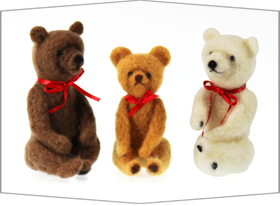 All of my needle felted sculptures are created with wool and stand on their own without an internal wire armature. Each one of a kind sculpture is an art piece and not recommended as toys for children or pets. All commissioned pieces can be customizable to your needs including size, expression, accessories (collars, coats, toys, food item) and pose. Since each commissioned piece is different in detail, size, etc., prices can vary. However, commissioned needle felted sculptures, for example, a solid colored dog approximately 3″ by 3″, generally start at $125.00. A piece of that size is a minimum of 10 hours of felting time. Commissioned pieces are scheduled as received. Upon completion, I will email photos of the finished product for your approval. Interested in a commission? Great! Please email me with what kind of commission you would like. If it’s a needle felted sculpture of your pet, animal, doll, etc. Also if you know any details of what you would like for size and other specifics so I can get a quote to you quickly. *an ambitious project that may require additional time at home depending on your skill level. 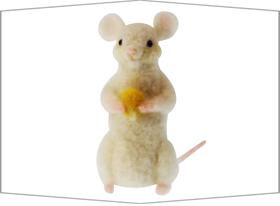 Lisa is known across the United States for her custom needle felted sculptures. 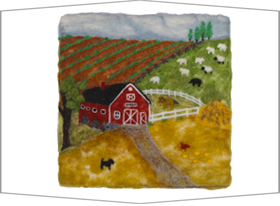 Each of her distinctive pieces is created using a single needle felting method. Using a barbed felting needle, she works the fibers until the sculpture is firm, holds a desired shape and stands on its own, eliminating the need for an internal armature structure. She uses natural and hand dyed local wool in the one of a kind pieces, utilizing alpaca, mohair, merino wool or silk for accents and details. Inspired by nature and wildlife, Lisa enjoys creating sculptures of wild animals as well as pets. Her past pet commissions have included dogs, cats, birds, horses, lizards and other small animals. Working from photo reference, she can capture a pet’s unique likeness and personality. In addition to animal sculptures, Lisa also experiments with an array of different fibers and techniques in creating pieces such as wall art, purses, vases, wallets, placemats, bird homes and other useful works of art. Other interests include boating, fishing, cars and stained and fused glass. Lisa moved from a small island community in Massachusetts to Fremont, NH in 1995.